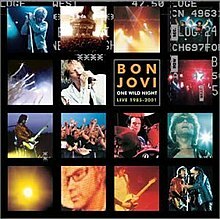 One Wild Night Live 1985–2001 is a live album by the American rock band Bon Jovi, released in May 22, 2001. The album includes live covers of Neil Young's "Rockin' in the Free World" and performance of The Boomtown Rats' "I Don't Like Mondays", with a guest appearance by their lead singer Bob Geldof. Though stating it was recorded from 1985-2001, only two of the songs were recorded before 1995 ("Runaway" and "In and Out of Love" in 1985). The album charted at #20 on The Billboard 200. "One Wild Night 2001" is a new remix version rather than a live version. The difference between this version and the original Crush version is the length; the intro and other sections were cut out. This was released as a single for this album and featured a music video. The new version also features on the compilation album Tokyo Road: Best of Bon Jovi. The live version of "Wanted Dead or Alive" was also released as a single and had a promotional video produced for it, this depicted live performances of the song and some backstage footage. The three Zurich songs were recorded at the Letzigrund Stadium, and were also released on The Crush Tour DVD. ^ "Australiancharts.com – Bon Jovi – One Wild Night - Live 1985-2001". Hung Medien. Retrieved 24 December 2016. ^ "Austriancharts.at – Bon Jovi – One Wild Night - Live 1985-2001" (in German). Hung Medien. Retrieved 24 December 2016. ^ "Ultratop.be – Bon Jovi – One Wild Night - Live 1985-2001" (in Dutch). Hung Medien. Retrieved 24 December 2016. ^ "Ultratop.be – Bon Jovi – One Wild Night - Live 1985-2001" (in French). Hung Medien. Retrieved 24 December 2016. ^ "Danishcharts.dk – Bon Jovi – One Wild Night - Live 1985-2001". Hung Medien. Retrieved 24 December 2016. ^ "Dutchcharts.nl – Bon Jovi – One Wild Night - Live 1985-2001" (in Dutch). Hung Medien. Retrieved 24 December 2016. ^ "Bon Jovi: One Wild Night - Live 1985-2001" (in Finnish). Musiikkituottajat – IFPI Finland. Retrieved 24 December 2016. ^ "Lescharts.com – Bon Jovi – One Wild Night - Live 1985-2001". Hung Medien. Retrieved 24 December 2016. ^ "Longplay-Chartverfolgung at Musicline" (in German). Musicline.de. Phononet GmbH. Retrieved 24 December 2016. ^ "Italiancharts.com – Bon Jovi – One Wild Night - Live 1985-2001". Hung Medien. Retrieved 24 December 2016. ^ "Charts.org.nz – Bon Jovi – One Wild Night - Live 1985-2001". Hung Medien. Retrieved 24 December 2016. ^ "Norwegiancharts.com – Bon Jovi – One Wild Night - Live 1985-2001". Hung Medien. Retrieved 24 December 2016. ^ "Hits of the World - Spain". Billboard. Nielsen Business Media, Inc. 16 June 2001. p. 45. Retrieved 3 December 2017. ^ "Swedishcharts.com – Bon Jovi – One Wild Night - Live 1985-2001". Hung Medien. Retrieved 24 December 2016. ^ "Swisscharts.com – Bon Jovi – One Wild Night - Live 1985-2001". Hung Medien. Retrieved 24 December 2016. ^ "Bon Jovi | Artist | Official Charts". UK Albums Chart. Retrieved 24 December 2016. ^ "Bon Jovi Chart History (Billboard 200)". Billboard. ^ "Spanishcharts.com – Bon Jovi – One Wild Night - Live 1985-2001". Hung Medien. Retrieved 11 January 2017. ^ "Austrian album certifications – Bon Jovi – One Wild Night" (in German). IFPI Austria. Enter Bon Jovi in the field Interpret. Enter One Wild Night in the field Titel. Select album in the field Format. Click Suchen. ^ "Brazilian album certifications – Bon Jovi – One Wild Night - Live 1985-2001" (in Portuguese). Associação Brasileira dos Produtores de Discos. ^ "Canadian album certifications – Bon Jovi – One Wild Night Live 1985-2001". Music Canada. ^ "Gold-/Platin-Datenbank (Bon Jovi; 'One Wild Night')" (in German). Bundesverband Musikindustrie. ^ "Spanish album certifications – Jon Bon Jovi – One Wild Night" (PDF) (in Spanish). Productores de Música de España. Select album under "Chart", enter the certification year in the field "Year". Select the certification week in the field "Semana". Click on "Search Charts". ^ "The Official Swiss Charts and Music Community: Awards (Bon Jovi; 'One Wild Night (Live)')". IFPI Switzerland. Hung Medien. ^ "British album certifications – Bon Jovi – One Wild Night". British Phonographic Industry. Select albums in the Format field. Select Silver in the Certification field. Type One Wild Night in the "Search BPI Awards" field and then press Enter. ^ "IFPI Platinum Europe Awards – 2001". International Federation of the Phonographic Industry. This page was last edited on 1 November 2018, at 04:40 (UTC).